I had been wanting a Vitamix for what feels like years. I see it mentioned over and over on so many blogs. At first I thought it was just a pricey blender. Then I found this page showing 52 video demonstrations of everything it can do. After seeing all that I really wanted one. So I went to work trying to convince my husband that I needed yet another appliance. This was a tough sell since I have so many appliances. My Kitchenaid blender was working just fine and it was a rare event that I even pulled it out. The Vitamix is not cheap… as in >$600 however Costco carries them and does demos once a year or so and they sell them for $394 I think. The trick of course was finding out when Costco was carrying them and then waiting. Delayed gratification is so not my thing. Imagine my excitement when I find out that the Costco nearest to me had them for that entire week. It was the final day. I talked my hubby and kids into grocery shopping. I was so excited. We got there and Ron seemed receptive to me getting one. And then…. there was no demo to be found. I was crushed. It would be months until I might have an opportunity again. Then a couple of weeks later we were at Costco and low and behold the Mighty Vitamix was there. It was hard to contain my excitement. I stood there watching the demo and asking countless questions and of course sampling many different treats. I was so sold. Ron… not so much but he did however agree!! I love this thing! I use it several times a day – everyday. These muffins are made using it. I’ve made them a couple times now. They are fun to make and always disappear in a day or two. 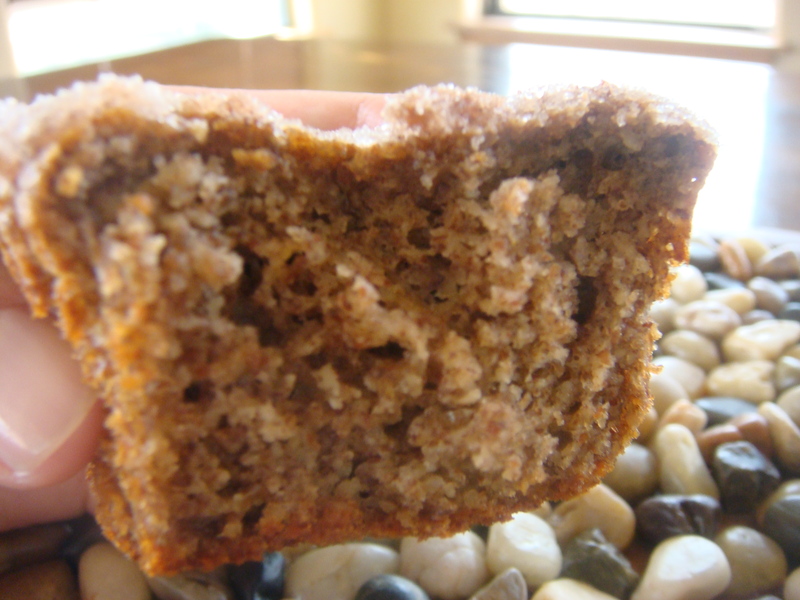 These muffins are grain, gluten, dairy, sugar, soy, corn, and brewers yeast free. They are low to moderate carb and are GAPS legal. They make a great snack or a quick on the go breakfast. They are just sweet enough, dense and moist. I hope you enjoy these as much as we do. Add bananas, eggs, dates and salt to Vitamix. Blend until smooth and there are no date pieces visible. (The Vitamix is so impressive – the dates I used were very dry and hard and it was still able to puree it into invisible bits.) Next, add coconut oil and mix briefly. Add almond flour and mix until well blended. Pour/scoop muffin mix into a large bowl. 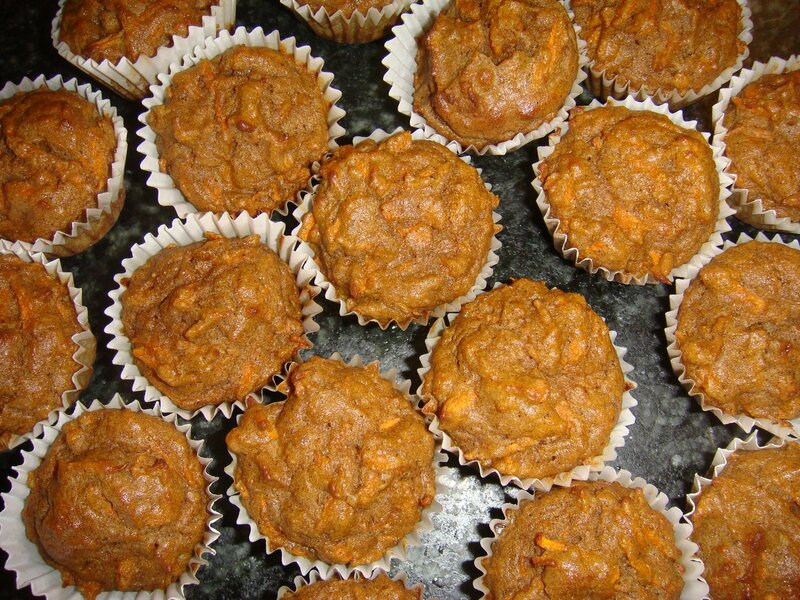 Fold in chopped pecans.Line 12 regular sized muffin tins. Divide batter equally for 12 muffins. Using an ice cream scoop is easiest. Bake for approximately 50 minutes at 325. Store in airtight container in the fridge. I actually enjoy these best cold. I accidentally made way too many baked sweet potatoes the other night. Now I have to try to find a use for them. Muffins of course are in order. These were great. 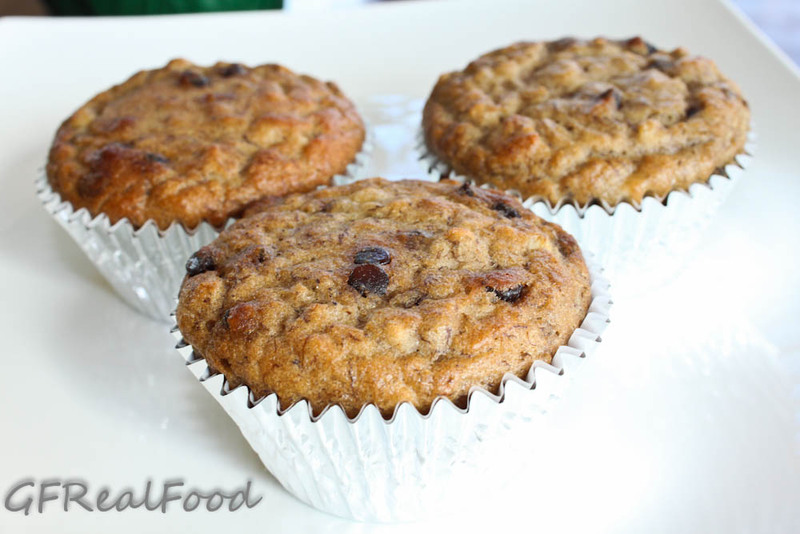 They are not typical muffins in that they are only subtly sweet. They are not like the muffins you would buy in the stores that are really cake. They are soft, moist and tender. They are grain, gluten, sugar and dairy free. 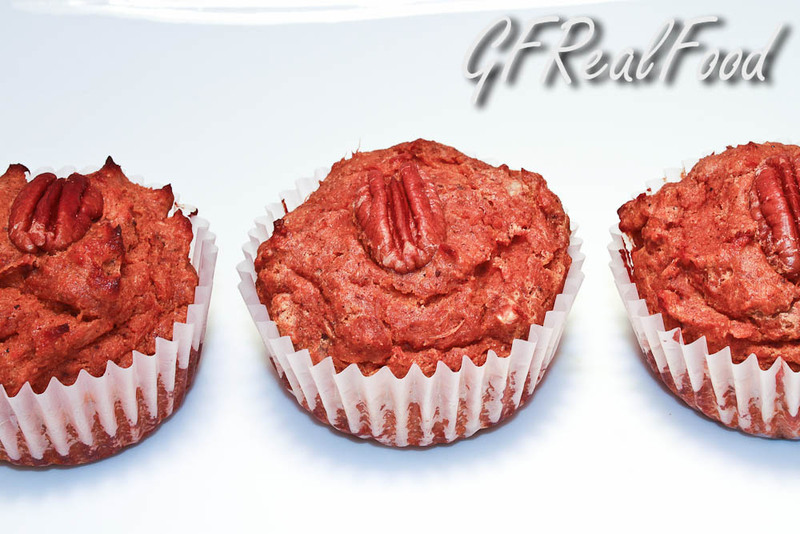 For a muffin, they are really low carb. I loved them both warm out of the oven or a day later smeared with virgin coconut oil. The kids liked them with butter and a little honey. These made a great breakfast or snack. This recipe has been entered in Real Food Weekly Jan 20/11 over at The Whole Gang. Score! Goal! Home run! Touchdown! In the kitchen I mean. In sports – never. I hate sports. All of them. I used to be engaged to a guy who loved ALL sports. He watched sports on TV any chance he could get. He would always scream excitedly for me to “COME QUICK!!! HURRY!! !” It was said with such urgency that I would come running as fast as I could in somewhat of a panic. Then he would follow that up with, “You HAVE to see this replay! !” My dislike for sports deepened and became hatred. I was born and raised in Canada. Every guy I ever dated played hockey – except one – he was a referee. I figured that if I were to have a man in my life then I was going to have to learn to tolerate sports. I had resigned myself to that. Then I met my husband. He is the polar opposite of fiance number one. He hates sports even more than I do. I think it is highly possible that he may be one of a kind. He is perfect for me in every way. The lack of sports in our life is just icing on the cake. We’ve been together for 16 years now and I still marvel at how lucky I am to have scored myself such a catch. Onto my latest kitchen success. donut muffins! If you like cinnamon sugar cake donuts but feel guilty about the white flour, sugar, seed oils…then you might have just found a great replacement. My kids LOVED these. All three! That never happens. Sage ate 2 right away and then came back for a third. For a kid who normally eats enough to stuff into a birds ear this is amazing. I have made these before but they were not dairy free. I do not use agave or Truvia anymore. 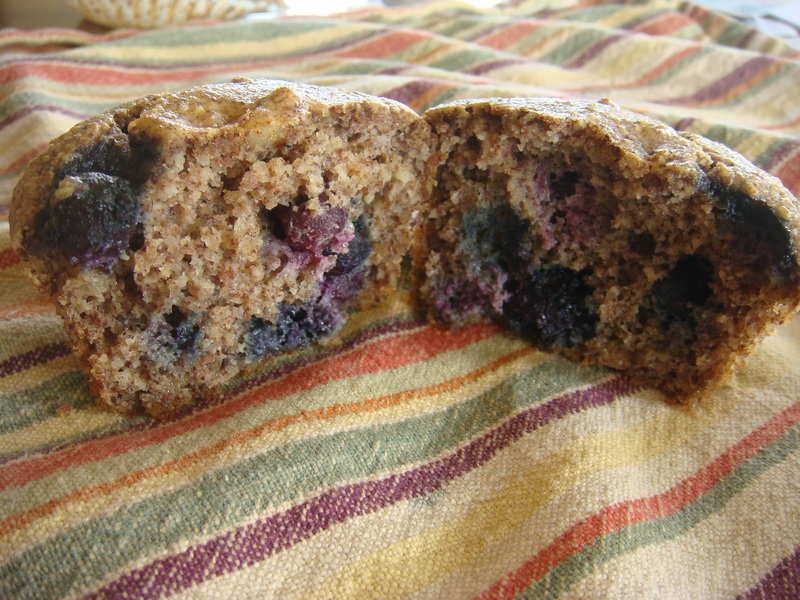 These muffins are super high in fiber and protein and would be a great on the go breakfast. Best though is that they taste great. They are best right out of the oven but if you have any left over store them in the fridge. Preheat oven to 350 degrees. Line 12 muffin tins. Mix dry ingredients well (exclude those used for topping). ***I have whole flax seeds and grind them in my little coffee grinder. I then sifted them so that the larger pieces were removed to help create a finer textured muffin. *** Add beaten eggs, melted coconut oil, water, and honey to the dry mixture. Mix well. Divide batter into 12 muffins. Bake for 25 minutes. Allow to cool slightly. Then melt coconut oil in a small bowl. Mix cinnamon and palm sugar in separate bowl. Dip a muffin top into the oil then dip it into the cinnamon sugar bowl. YUM! Can anyone tell me what makes a man tick? Because I am at a loss. My husband whom I think is (usually) a genius leaves me scratching my head. Why? Let me tell you how my day started. We have 2 of iPod touches, the ones that have Face to Face which is video calling. First just let me say that I hate the idea of video calling. I don’t want to be bothered worrying about how I look just to make a phone call. It’s great for the kids and Grandma and for the kids and my husband or I while at work. However it’s not great when the iPod rings at 5:20 am because my husband, who was at work, thought I would be awake and he wanted to demonstrate to a male co-worker how the thing worked. Seriously?! I ignored the call and tried to go back to sleep. Then he called back at 6:30. I had just woke up and was barely upright or even thinking yet. I answer the call and while waiting to connect see myself on the screen and ponder what has become of me. Can you now imagine how mortified I am when the call connects and there is Ron’s co-worker staring back at me. Seriously, what was my husband thinking?! Now I know better than to show my face when I answer a call. One of my favorite blogs is Elana’s Pantry. Nearly everything this woman posts looks great. For me the problem is that she uses a lot of almond flour. I love almond flour, just not the price. She recommends one particular brand, Honeyville Blanched Almond Flour. While I’m sure it is a great product, I just can’t see myself spending that kind of money on flour. 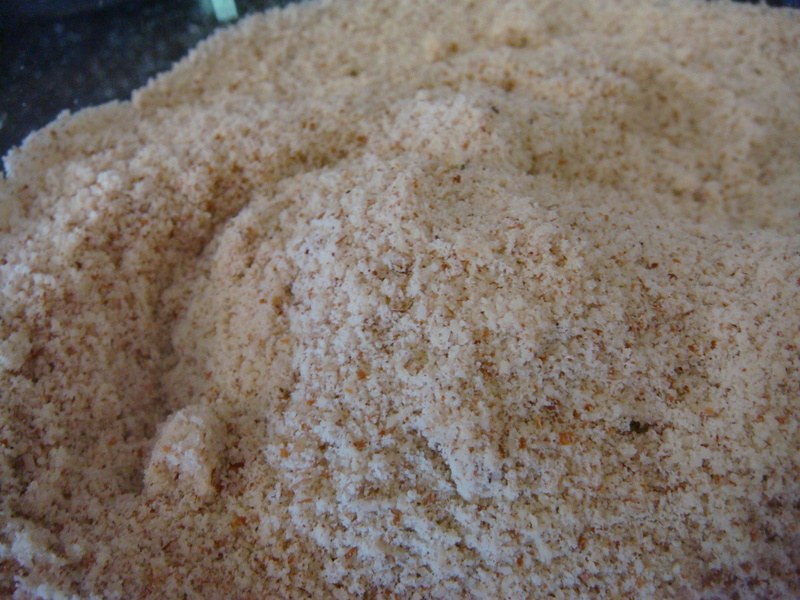 As I have said before on this blog, we grind a lot of our own flours. We grind amaranth, millet, buckwheat, quinoa, rice and corn. We save a TON of money doing it this way. Since I am leaning toward a grain free diet lately it got me wondering if I could make my own almond flour. Turns out that yes, I can. It’s quick and easy. I have used this almond flour for cookies, muffins and pancakes. So far everything I have tried with it has worked out great. I have never purchased almond flour so I guess I have nothing to compare mine too but I expect that mine is moister so I need to use a bit less oil in whatever recipe I am using if the recipe calls for commercial almond flour. The only things you need to make this is a coffee grinder (preferably not one that you use coffee beans for) and a wire mesh sieve. Add 1/3 to 1/2 cup of whole raw almonds to the coffee grinder. Grind until you have a fine meal. When you hear the grinder make a different noise and the almond meal inside is not moving well anymore, stop. If you continue you will be making chunky almond butter. 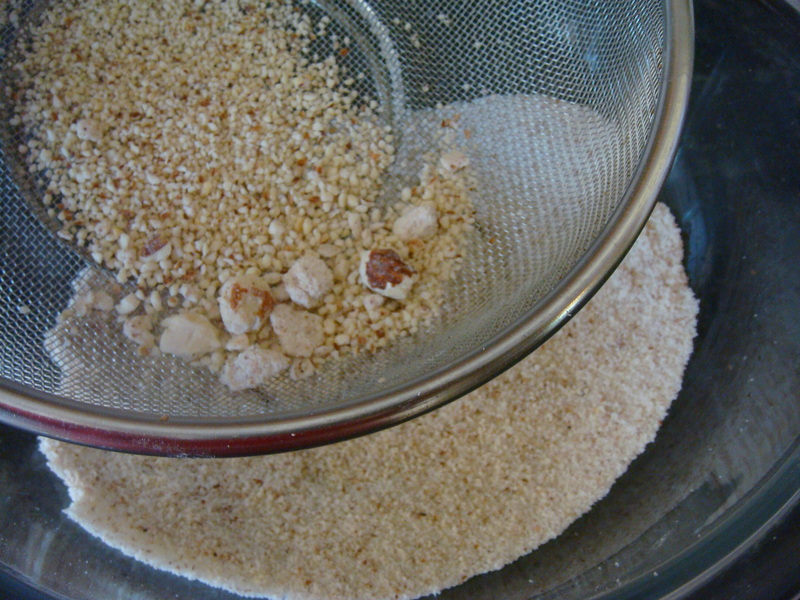 Pour the almond meal into a sieve which is sitting in a large bowl. Shake out the almond flour into the bowl. The larger meal and some bigger pieces will be left over. Just leave them in the bowl for now and repeat the process until you have the amount you need. Then add back into the grinder all those small pieces and the courser meal and grind again. I must get at my day now. The kids found the small head of a salamander in the living room this morning. I have got to locate the rest of him. Yup, that’s desert life! 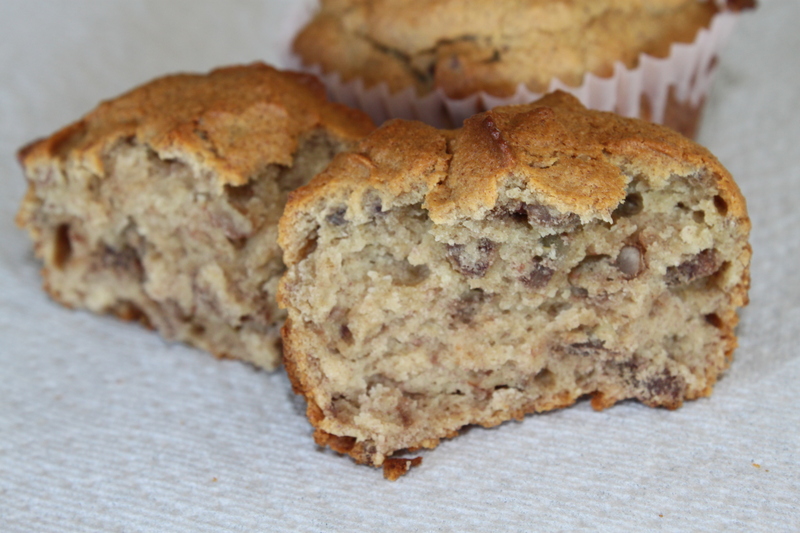 I made these muffins this morning and was really pleased with how they came out. They are moist, tender and not too sweet. They are gluten free, dairy free, low carb and sugar free. They are satisfying and high in protein, omega 3’s and fiber. These would make a great breakfast. Preheat oven to 350. In coffee grinder grind flax seeds and add to large bowl. Then grind whole raw almonds in coffee grinder. My coffee grinder is small so I had to do 1/2 cup at a time. Add almonds to bowl with flax seeds. Add baking powder, salt, nutmeg and cinnamon to almonds and flax seeds. Mix to combine. In a food processor add dates and water. Process until dates are blended as much as possible (maybe 3-4 minutes). Add eggs and oil. Process for 10 – 15 seconds until blended. Add wet ingredients to dry ingredients. Stir until there are no lumps. Let batter sit for 15 or 20 minutes to thicken. Then fold in frozen blueberries. Using an ice cream scoop fill 12 lined muffin tins. Bake for 25 minutes or until center is set and toothpick comes out clean. I have said before that anything that I can slip veggies into and is still eaten is always a winner in this house. I made these the other day and they were spectacular. Not only are they grain free, gluten and dairy free but they are really low carb, free of processed sugar, high in fiber AND has a whole cup of grated carrots! What more could I ask for? !